Grace College students with President Katip at Supermarket Sweep 2015. Pictured left to right are Tyler Rothhaar, Evan Kilgore, Dr. Bill Katip, Elizabeth Manko, Tyler Tillett and Jonah Stouffer. WINONA LAKE — Grace College and Seminary and Mission Point Community Church sponsored Supermarket Sweep: Give ‘Til You Drop at Owen’s Supermarket, Wednesday, Nov. 18. Throughout the day, Grace students, members of Mission Point and community members bought non-perishable food and baby items for area non-profit organizations including Combined Community Services, Our Father’s House, The Salvation Army and Heartline Pregnancy Center. This fifth-annual event was the most successful ever, generating $26,124 in food and products for those in need. 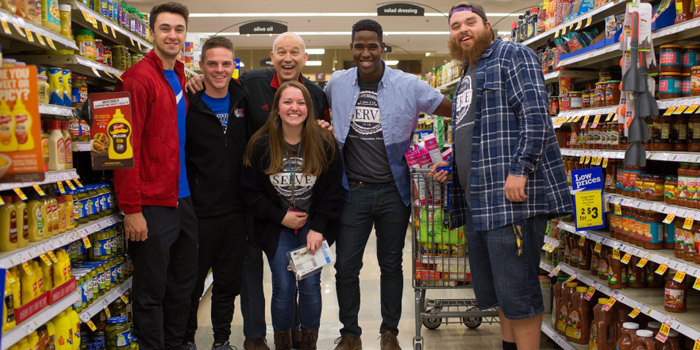 According to Kearstin Criswell, coordinator of student involvement for Grace College and Seminary, “We are delighted with the great community response and student involvement in Supermarket Sweep this year. At the end of the day, about half of the donations came from Grace students and half from the community — a true team effort to help those who need assistance in our area.” Nearly 450 Grace students participated in this year’s event, one of several outreach events organized by Serve, Grace College and Seminary’s student-led community service ministry, each year. Sponsors of this year’s Supermarket Sweep: Give ‘Til You Drop included Grace College and Seminary, Mission Point Community Church, DePuy Synthes, Nextremity Solutions and Wildman Business Group.